Revenue is the value of all sales of goods and services recognized by a company in a period. Revenue (also revered to as Sales, Turnover, or Income) forms the beginning of a company’s Income StatementIncome StatementThe Income Statement (or Statement of Profit and Loss) shows performance from operations of a business. The financial statement begins with revenues and and often considered the “Top Line” of a business. ExpensesAccrued ExpensesAccrued expenses are expenses that are recognized even though cash has not been paid. These expenses are usually paired up against revenue via the the matching principle from GAAP (generally accepted accounting principles). For those who are unaware of the matching principle are deducted from a company’s revenue to arrive at its Profit or Net IncomeNet IncomeNet Income is a key line item, not only in the income statement, but in all three core financial statements. While it is arrived at through the income statement, the net profit is also used in both the balance sheet and the cash flow statement.. According to the revenue recognition principleRevenue Recognition PrincipleThe revenue recognition principle dictates the process and timing by which revenue is recorded and recognized as an item in the financial statements. in accounting, revenue is recorded when the benefits and risks of ownership have transferred from buyer to seller, or when the delivery of services has been completed. Notice that this definition doesn’t include anything about payment for goods/service actually being received. This is because companies often sell their products on credit to customers, meaning that they won’t receive payment until later. When goods or services are sold on credit, they are recorded as revenue, but since cash payment is not received yet, the value is also recorded on the balance sheetBalance SheetThe balance sheet is one of the three fundamental financial statements. These statements are key to both financial modeling and accounting. The balance sheet displays the company’s total assets, and how these assets are financed, through either debt or equity. Assets = Liabilities + Equity as accounts receivableAccounts ReceivableAccounts Receivable (AR) represents the credit sales of a business, which are not yet fully paid by its customers, a current asset on the balance sheet. Companies allow their clients to pay at a reasonable, extended period of time, provided that the terms are agreed upon.. When cash payment is finally received later, there is no additional income recorded, but the cash balance goes up, and accounts receivable goes down. To learn more, explore CFI’s free Accounting Fundamentals Course. Below is an example of Amazon’s 2017 income statement. Let’s take a closer look to understand how revenue works for a very large public company. 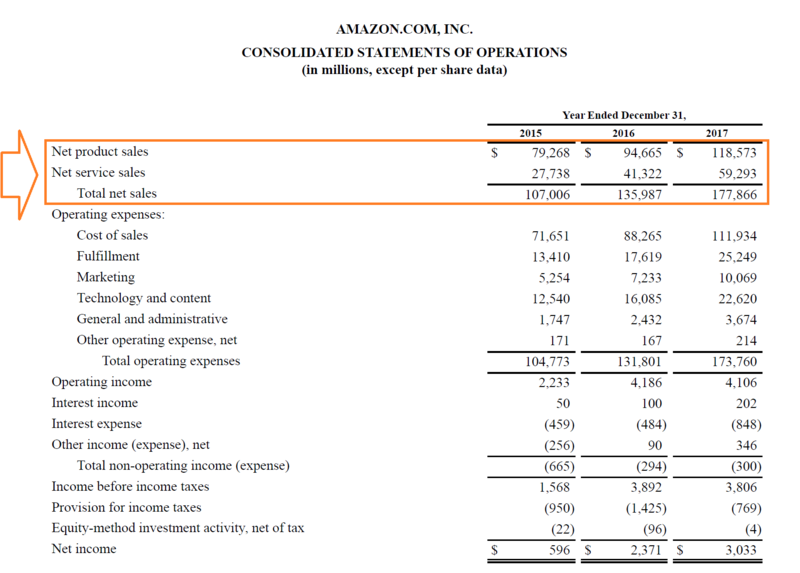 Amazon refers to its revenue as “salesSales RevenueSales revenue is the starting point of the income statement. Sales or revenue is the money earned from the company providing its goods or services, income,” which is equally as common as a term. It reports sales in two categories, product and service, which then combine to form total net sales. In 2017, Amazon recorded $118.6 billion of product sales and $59.3 billion of service sales, for a grand total of $178.9 billion. The figure forms the top line of the income statement. Beneath that are all operating expenses, which are deducted to arrive at Operating Income, also sometimes referred to as Earnings Before Interest and Taxes (EBIT)EBIT GuideEBIT stands for Earnings Before Interest and Taxes and is one of the last subtotals in the income statement before net income. EBIT is also sometimes referred to as operating income and is called this because it's found by deducting all operating expenses (production and non-production costs) from sales revenue.. Finally, interest and taxes are deducted to reach the bottom line of the income statement, $3.0 billion of net income. The revenue formula may be simple or complicated, depending on the business. For product sales, it is calculated by taking the average price at which goods are sold and multiplying it by the total number of products sold. For service companies, it is calculated as the value of all service contracts, or by the number of customers multiplied by the average price of services. The formulas above can be significantly expanded to include more detail. For example, many companies will model their revenue forecastForecasting MethodsTop Forecasting Methods. There is a wide range of frequently used quantitative budget forecasting tools. 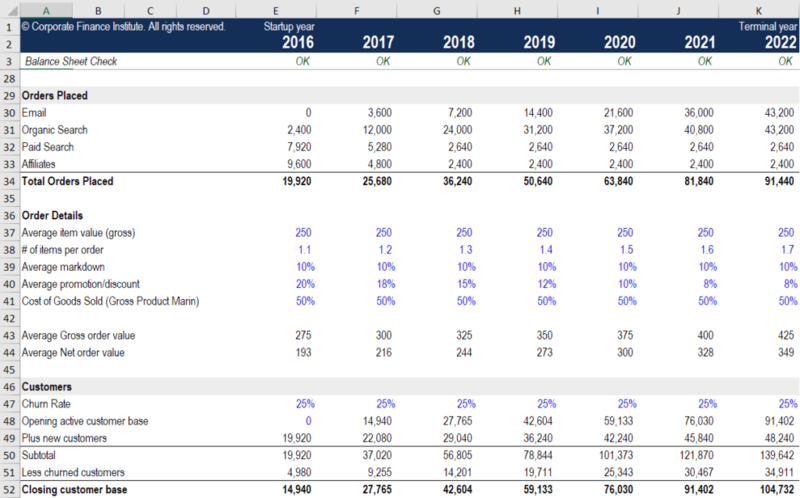 In this article, we will explain four types of revenue forecasting methods that financial analysts use to predict future revenues. Four Types of revenue forecasting include straight-line, moving average, regression all the way down to the individual product level or individual customer level. As you can see in the example above, there is much more that can be included in a forecast other than just No. of Units x Average Price. CFI’s e-Commerce Financial Modeling Course provides a detailed breakdown of how to build this type of model, which is extremely important for forecasting and business valuation. Sales are the lifeblood of a company, as it’s what allows it to pay its employees, purchase inventoryInventoryInventory is a current asset account found on the balance sheet consisting of all raw materials, work-in-progress, and finished goods that a company has accumulated. It is often deemed the most illiquid of all current assets, and thus it is excluded from the numerator in the quick ratio calculation., pay suppliers, invest in research and developmentResearch and Development (R&D)Research and Development (R&D) is a process by which a company obtains new knowledge and works on the introduction and improvement of its products and, build new property, plant, and equipment (PP&E)PP&E (Property, Plant and Equipment)PP&E (Property, Plant, and Equipment) is one of the core non-current assets found on the balance sheet. PP&E is impacted by Capex, Depreciation and Acquisitions/Dispositions of fixed assets. These assets play a key part in the financial planning and analysis of a company’s operations and future expenditures, and be self-sustaining. If a company doesn’t have sufficient revenue to cover the above items, it will need to use an existing cash balance on its balance sheetBalance SheetThe balance sheet is one of the three fundamental financial statements. These statements are key to both financial modeling and accounting. The balance sheet displays the company’s total assets, and how these assets are financed, through either debt or equity. Assets = Liabilities + Equity. The cash can come from financing, meaning that the company borrowed the money (in the case of debt), or raised it (in the case of equity). In order to perform a comprehensive analysis of a business, it’s important to know how the 3 financial statementsThree Financial StatementsThe three financial statements are the income statement, the balance sheet, and the statement of cash flows. These three core statements are intricately linked to each other and this guide will explain how they all fit together. By following the steps below you'll be able to connect the three statements on your own. are linked and see how a company either uses its sales to fund to the business or must turn to financing alternatives to fund the business. To learn more, watch CFI’s free webinar on how to link the 3 financial statements in Excel. Below, we will explore what the concept of revenue means in different sectors. As you will see, it can be composed of many different things and varies widely in terms of what the most common examples are, by sector. The three main areas that typically make up the finance industry are public financePublic FinancePublic finance is the management of a country's revenue, expenditures, and debt load through various government and quasi-government institutions. This guide provides an overview of how public finances are managed, what the various components Examples,, personal financePersonal FinancePersonal finance is the process of planning and managing personal financial activities such as income generation, spending, saving, investing, and protection. The process of managing one’s personal finances can be summarized in a budget or financial plan., and corporate financeCorporate Finance OverviewCorporate Finance involves the financial aspect of businesses wherein sources of funds are determined, existing assets invested, excess profits distributed. Corporate finance also includes the tools and analysis utilized to prioritize and distribute financial resources. The ultimate purpose of corporate finance is to. And we demonstrated above, the various sources of income in each type can be quite different. While the above lists are not exhaustive, they do provide a general sense of the most common types of income you’ll encounter. EBIT GuideEBIT GuideEBIT stands for Earnings Before Interest and Taxes and is one of the last subtotals in the income statement before net income. EBIT is also sometimes referred to as operating income and is called this because it's found by deducting all operating expenses (production and non-production costs) from sales revenue. Net IncomeNet IncomeNet Income is a key line item, not only in the income statement, but in all three core financial statements. While it is arrived at through the income statement, the net profit is also used in both the balance sheet and the cash flow statement.